the rupture of professional media codes, which signaled complete panic and disarray […], the infinity of possible alternative discourses, of other possible modes of explanation and interpretation. According to Kluitenberg, these empty spaces trigger our horror vacui, our fear for empty spaces like the void. In digital glitch art, the void is often a place where structures of meaning are, sometimes intentionally, ruined. Here, the concept of ‘ruin’ means a mode of working, but also simultaneously underlines the constructedness of the work. The ruins’ formal fragmentation makes it clear that its meaning is open to interpretation and meaningful engagement. As a result, it is never finished, wholesome or completed; it is not static but differs from reading to reading (syntax). In this sense, the place where the code is ruined can be understood as a place where alternate readings can be created; a virtual space where an infinite amount of potential meanings can become actualized by the reader. To create meaning, the reader needs to impose constraints and limitations on other possibilities. In this sense, every act of creation is also an act of destruction (of the infinity of possibilities). The Dutch / Belgium art duo Jodi (in which Jo stands for Joan Heemskerk and di for Dirk Paesmans) is an example of a couple that makes subversive glitch art, which battles against the hegemonic flow. 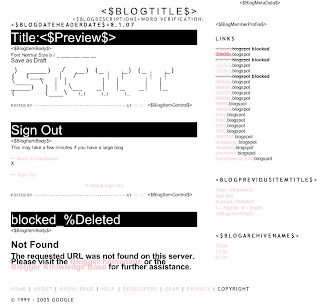 During 2006 and 2007 Jodi made the work <$BlogTitle$>, which is based on the social blogging software from Google (Blogger). <$BlogTitle$> looks like a place where the software is glitched; it doesn’t seem to function correctly. The pages of Jodi’s blog are filled with text that either seems to belong to the backend of the software, or doesn’t mean anything at all (within conventional language systems). S ocial blogging software like Blogger is often described as a democracy-enhancing tool. However, <$BlogTitle$> exposed the myth that blogs are the medium that realized total freedom of speech, when Blogger interpreted <$BlogTitle$> as a malicious spamblog and actually blocked 3 of the blogpages Jodi created. In this case, the process of making meaning became very literally a process of destruction. Moreover, it became clear at once that blog users actually have to answer to a built-in political system. This politics is based on a system governed by the desire and belief that it will be used to distribute knowledge and opinions in a specific, ‘preformatted’ way. Bloggers that do not answer to these conventions risk the possibility of being blocked or to have their blogs completely deleted. It is obvious that our work fights against high tech. We also battle with the computer on a graphical level. […] We explore the computer from inside, and mirror this on the net. Jodi shows that the error is socially constructed. Software is more than just a programmable tool; it is a materialization of different modalities and syntaxes, a union of multiple processes and discourses, an “assemblage”, to use the term Matthew Fuller borrows from Deleuze and Guattari. we gain access to it by several entrances, none of which can be authoritatively declared to be the main one; the codes it mobilizes extend as far as the eye can reach, they are indeterminable […]; the system of meaning can take over this absolutely plural text, but their number is never closed, based as it is on the infinity of language. Classical literature is often characterized by its separation between the writer and reader. This is why the reader only has partial freedom to interpret. Instead of gaining access to the signifier (the process of making meaning), he can often only accept or deny the text. In this sense, reading a book can be compared to participating in a referendum. In non-linear texts like <$BlogTitle$>, the reader can make meaning actively, by choosing his own path. Therefore, the constructed meaning is never ‘true’. To Barthes, the goal of the ultimate text is not to be consumed, but to be produced, which might mean that the text loses its original meaning. This process is what Barthes described as the death of the author. In the case of <$BlogTitle$>, the void is the space of negation; it is used as a generative and creative force. In doing so, spectators are forced to use their imagination. The glitch formal fragmentation signifies that the work is ‘open’ to interpretation and meaningful engagement. This new text is no longer a work that displays or retells history, but a writerly text where history of the work is activated and meaning can be actively (re)constructed. In the case of <$BlogTitle$>, this openness also had a negative consequence; Blogger interpreted the blog as a malicious spamblog and consequently blocked it. I think this could be described as a rather rigorous death of the author, who took his work with him in the grave. Jodi uses software as a theatrical object, in which conventional uses are subverted and borders and limitations are magnified. The glitches Jodi constructs are within the system, but do not follow the rules, the language or syntax of the system. They reside on the border of sense and nonsense and break with the spectator’s expectations. Therefore, the glitch resides on the border of system and non-system, meaning and non-meaning, truth and interpretation. I would like to conclude that Jodi’s work resides on what Deleuze and Guattari described as the line of flights, the abstract line of mutation; where axioms are questioned, genres are broken open and categories are created. Kluitenberg, Erik. Delusive Spaces. Essays on Culture, Media and Techno.logy. Rotterdam: NAi Publishers and Amsterdam: Institute of Network Cultures, 2008. p. 357. Faber, Lievnath, Tim van der Heijden and Rosa Menkman. “In-between Manifesto”. Masters of Media. http://mastersofmedia.hum.uva.nl/2008/05/30/in-between-manifesto/ 20th August 2008. Deleuze, Gilles and Claire Parnet, Dialogues II. London and New York: Continuum, 2006. p. 112. Jodi. <$BlogTitle$>. 2006-2007. http://blogspot.jodi.org/ 20th August 2008. Matheson, Donald. “Weblogs and the Epistemology of the news : some Trends in Online Journalism”. In Sage Journals. London: SAGE Publications, Thousand Oaks CA and New Delhi Vol 6 (4): p. 443-468. 2004. p. 445. These blocked pages are located at: http://d4d4d4.blogspot.com/, http://b1b1b1.blogspot.com/, http://a0a0a0.blogspot.com/. 20th August 2008. Baumgärtel, Tilman. TP: Interview with Jodi. We love your computer. In Telepolis. mei 2006. http://www.heise.de/tp/r4/artikel/6/6187/1.html 20th August 2008. A discussion around the artwork OSS (Jodi, OSS. 2001 http://oss.jodi.org/) can be found here: What the hell is oss.jodi.org ???!! – Club CDFreaks – Kno.wledge is Power http://club.cdfreaks.com/f1/what-hell-oss-jodi-org-2451/. 20th August 2008. Barthes, Roland. S/Z. Paris: Seuil, 1970. p. 5-6. Barthes, Roland. S/Z. Paris: Seuil, 1970. p. 4.